Micronodular cirrhosis of the liver is the formation of smaller sized nodules in the liver. Cirrhosis of the liver is the formation of fibrous tissue which replaces the healthy tissue in the organ. It is a chronic form of the disease which can lead to scarring of the portal tract which carries blood rich in nutrients from the intestines to the liver. Due to the increasing appearance of fibrosis, the liver lobules and vasculature develop a disorganized and damaged cellular structure . This process can also cause degeneration of liver cells called hepatocytes which disrupt liver function. Micronodular cirrhosis: In this type of cirrhosis, the nodules formed are less than 3mm in size. It is due to prolonged long term chronic damage to the liver. Macronodular Hepatic Cirrhosis: This is defined as the type of cirrhosis where the nodules are equal to or greater than 3mm. Most causes that lead to macronodular cirrhosis are acute in nature such as viruses, toxins and poisoning cases. Micronodular cirrhosis occurs due to a variety of reasons. Most causes leading to this type of cirrhosis are chronic in nature. The morphological appearance of the liver may change from micronodular to macronodular as the liver disease progresses. 1. 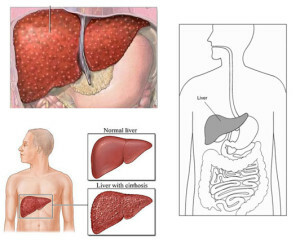 Alcoholic cirrhosis: This type of cirrhosis occurs in 10-20% of the individuals who drink heavily for a decade or more. The damage caused by cirrhosis is not reversible or rarely reversible. In mild or moderate cases, stopping alcohol intake may slow or halt further disease progression. Alcohol being absorbed from the gut makes contact with the portal triad first and the hepatocytes surrounding it. 2. Hereditary Hemochromatosis: This is an inherited condition of iron overload in the body. It is also known as ‘bronze diabetes’. It commonly presents with a family history of cirrhosis, skin pigmentation, diabetes, pseudo-gout or cardiomyopathy. 3. Primary biliary cirrhosis: It is more common in women. It may be asymptomatic in nature or the individuals may complain of an enlarged liver, fatigue, pruritis, skin pigmentation, without jaundice. 4. Primary sclerosing cholangitis: It is a progressive condition which may present with pruritis, steatorrhea (fatty stools), vitamin deficiencies and metabolic bone disease. 5. Hepatic venous outflow obstruction: This can occur due to conditions like Budd-Chiari syndrome or veno-occlusive disease. The blood that cannot leave the liver puts backwards pressure on the liver and causes liver enlargement. This long term injury results in micronodular cirrhosis. A liver biopsy is the most definitive test for the correct diagnosis of cirrhosis of the liver. The specimen observed under the microscope will reveal the specific cause of a cirrhotic liver. There are various other blood tests which may help diagnose a definitive cause and hence a targeted treatment. 1. Hereditary hemochoromotosis: Blood reports will show transferring saturation of greater than 60% and ferritin greater than 300ng/ml. If the disease runs in a family, genetic testing for HFE gene mutations can be done before the symptoms begin to appear. The only effective treatment is regular phlebotomy to lower blood iron levels. 2. Primary biliary cirrhosis: Elevated alkaline phosphate in the liver function tests as well as rising cholesterol and bilirubin hint at this condition. Antimitochondrial antibodies are also present. Liver biopsy will show florid bile duct lesions as a confirmation. 3. Primary sclerosing cholangitis: It is best studied with contrast studies like contrast cholangiography. This will show a ‘beaded appearance’ of the bile ducts. This occurs because of diffuse, multifocal strictures and focal dilation of bile ducts. Non-specific immunoglobulins may also be elevated. Cirrhosis can progress on to more serious health complications including hepatic encephalopathy, ascites, portal hypertension, gastrointestinal varices or even death. You can halt the progress of disease by taking preventive measures. Recovery from micronodular cirrhosis of the liver is not possible because cirrhosis is irreversible in nature.